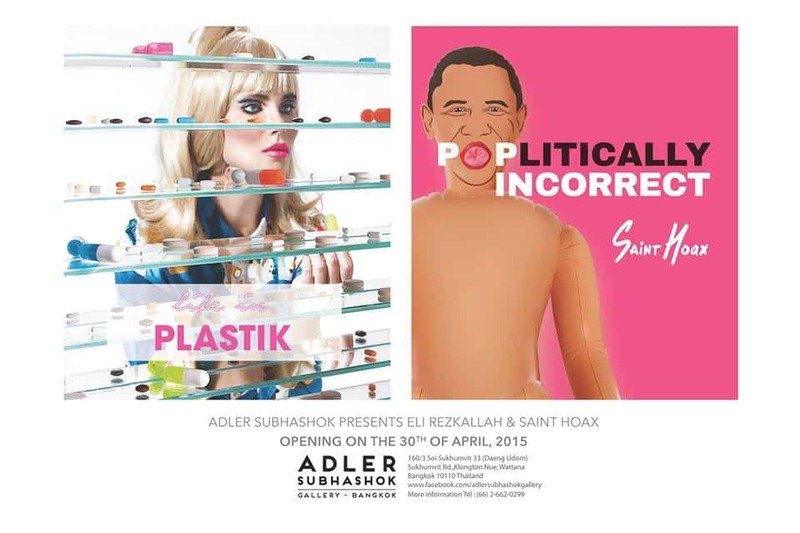 This summer, we bring these 2 exhibitions (Life in PLASTIK & POPlitically incorrect) to our Gallery, Gonna be fun! The Adler Subhashok Gallery Bangkok proudly presents “Life in Plastik” a retrospective of the Middle East’s first Visual Publication established in 2009 by visual artist Eli Rezkallah. The show features 32 of Rezkallah’s boldest and most eye-popping large-scale color interactive photographs and art installation stemming from his collaborative work with creative talents from all around the world since 2008 in addition to his collaboration for Plastik Magazine from 2010 until 2014 with Creative Director Ryan Houssari. Rezkallah’s inspiration started at a very young age. Having grown up in a secluded oasis in the middle of war-torn Lebanon, he was always surrounded by women who were constantly putting on a good face and deliberately turning a blind eye towards their country’s tense social-political situation. Rezkallah’s work is a visual representation of women in denial and the measures they take to escape reality, and to recreate their own. No matter how colorful and vibrant they would paint their world, they could never hide the sentiment of dread that they felt from living in an environment on the verge of destruction. Rezkallah’s work typically juxtaposes pure and flawless beauty with off-putting melancholia and lethargy. His subjects, styled with razor-sharp meticulousness and placed in surreal settings, feel stoic and empty; unimaginative souls lost in a most imaginary world. Saint Hoax debuts his first solo show, “PoPlitically Incorrect”, featuring his satirical series of reimagined popular icons. The world’s most recognized figures become almost unrecognizable once merged with Hoax’s vision. The show is an interactive journey that rewrites history by turning gunpowder into glitter, and tyrants into faux queens. Eli Rezkallah was born in Beirut, Lebanon, in 1986. He started his career as a fashion show producer in 2004 and quickly branched out as a visual artist, opening his own studio, Beyond Production, in 2007. Ambitious and eager to build on his unique vision, Rezkallah launched Plastik Magazine, Middle East’s first visual publication, in 2009. From its first issue, Plastik quickly established itself as a platform for young talents to showcase their work and served as a medium for Rezkallah to share his uncompromised vision with the world. In 2010, Rezkallah joined forces with Creative Director Ryan Houssari and together they created a creative dynamic and shared their vision through Plastik, later that year, Plastik was awarded “Best Publication in the Middle East” at the Dubai International Printing Awards and the Premier Print Award in New York by the Printing industries of America Inc. Available in over 50 cities worldwide, Rezkallah’s Plastik has consistently published groundbreaking visual art, including his own. Passionate and fiercely original, Rezkallah is best known for the colorful dream-like worlds he creates and the glamorous beautiful women who inhabit them, often depicted in surreal situations. Saint Hoax is a pseudonymous Middle Eastern artist, satirist, and sociopolitical activist. An embedded infatuation with popular culture and politics drove Saint Hoax to embark on his PoPlitical journey. Hoax combines tangible and digital mediums to create beautiful visual lies that tell an ugly truth.